This project grew from an idea to recreate the simple bike I had as a kid. I found the frame (maker unknown) on eBay for $50, including the fresh powdercoat paint job. While waiting for it to arrive, I spent some time browsing Sheldon's site and became curious about fixed gear. After reading all the testimonials, I wanted to see what it was all about. I special-ordered the wheels from QBP, built with Surly hubs and Rhyno Lite rims, and bought IRC semi-slicks to go on them. The rear is a flip-flop, with 45 and 65 inch gearing. The rest of the parts are a mix of new and used from local shops, from my son David, and from eBay. This bike is number four in my corral, and quickly became my favorite for short workouts of an hour plus. I also have a Jamis road bike and two mountain bikes, one of those serving mostly as a trainer and for winter road rides. 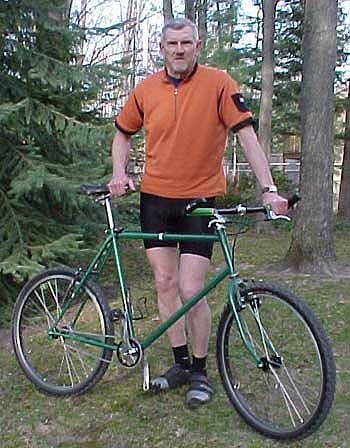 At 67, I'm new to cycling. My start was doing the 2000 Subaru Iceman Cometh Challenge. Four of my grown children, and two of their spouses share this passion for biking. All seven of us completed the 2002 Iceman last November. Now my new challenge is to extend my enjoyment to riding fixed off road. Jim Hintz first contacted us in February 2003. We hope to publish more details of his achievements.